There have been countless movies made about World War II, both from Hollywood and studios abroad, and their stories are most often told from the perspective of Americans, Germans or the Japanese, which isn't surprising given the corresponding countries were the most “popular” at the time. 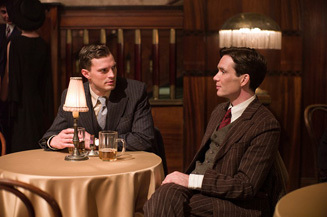 But practically every nation on earth has its own WWII stories to share, and one of the refreshing aspects of Anthropoid is that it tells us about a relevant albeit not generally well-known event that took place in Czechoslovakia and tells it from the point of view of Czechoslovakian characters (though they're played by mostly non-Czech actors). The event is the attempted assassination of Reinhard Heydrich, a high-ranking Nazi official, by a group of Czech resistance fighters. Heydrich's brutality in Czechoslovakia following Germany's invasion in 1939 earned him the nickname, “The Butcher of Prague,” and he's also credited with architecting Hitler's infamous “Final Solution” - the plan to exterminate all Jews in Europe. Director and co-writer Sean Ellis uses this event not only to convey an important history lesson, but to evoke an atmosphere of dread and dire anticipation for the characters, who believed they were acting in the best interests of not only their country but also the world by ridding it of evil. Ellis and Anthony Frewin's screenplay sees these men not as superheroes or action stars, but rather as vulnerable human beings who, despite their important and complex mission, were still subject to emotions such as fear, anxiety, love and anger. The film also stresses their plan was not guaranteed to succeed, and whether or not it does, I leave for you to discover either by seeing Anthropoid or reading about its history. For these reasons, we can appreciate the film, not least because it reminds us the war affected other, less “popular” nations and its people. However, the film's assets only take it so far, because underlying its arguably engaging story, strong acting and noble intentions is a rather conventional and uninspired structure, much of which is too routine and manipulative to really get behind. Even if it is based on fact, we've seen other historical dramas and pure action movies play out the same way and employ similar narrative devices, right down to one of the final shots in which one character sees a vision of another before deciding his own fate. Surely there must have been a more original and artistic way to transcribe the history surrounding Anthropoid besides having it all boil down to a shoot-out. Just because it happened in real life doesn't mean it has to happen on film. The cinema, after all, is a platform for artistic expression, and compromises can be made to represent truth if it means a more stimulating experience.